Happy Friday gang! I'm extremely ansty to get through this day and on to a superfun weekend. 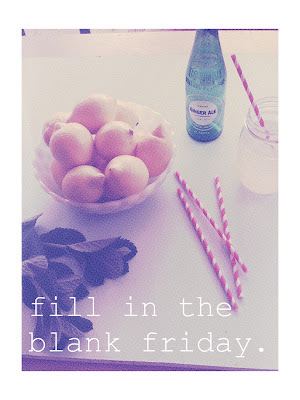 I like today's Fill in the Blank Friday. I actually have alot of real work to do today, but, I think blogging should probably take precedent, don't you? 1. The last thing I ate was a cobb salad from one of my favorite Houston (I've been here for a couple days while I'm still gypsy-ing it up) restaurants, Barnaby's. I'm trying to get back on carb-less eating as much as I can because I've got to squeeze myself into a bridesmaid dress way sooner than I'm comfortable with. oops. 2. The next thing I'd like to eat is breakfast. I wake up hungry every single day and can never skip it. Today, since I'm home, I'm waiting on my mom to figure something out for me. Do you still do that when you go home? Will I ever be too old for that? 5. Sports are fun, and I enjoy watching and being a fan - to a certain extent. I love the festiveness and spirit of UT games, but honestly the outcome of the game doesn't really mean all that much to me. There are many men in my life (that are close to my heart) who I'd wish would chill out on the sports crazy fandom, but I gave that battle up long ago. 6. I miss having a kitchen. There are few things I enjoy more than trying new recipes and cooking for people. I don't know when this interest/love kicked in for me, but all of a sudden one day, I like domestic things. It's so strange, but I love it. That's one thing I'm looking forward to about having a roommate, she gets to try all my creatitions - and she'll tell me the truth. 7. Right now I am waiting for my coffee to kick in. For some reason it's slower than normal, but that could just be a Friday thing! Poodle loves are the best!! why does all food talk make me hungry?